The yellow metal showing down position for the evening session of Wednesday. Gold future down by 24 RS in global domestic market ,gold august delivery has been traded on downside,but spot gold prices shot up by Rs 685 to hit an over one-month high of Rs 28,365 per 10 grams in Tuesday's trade. 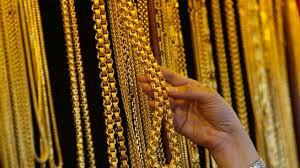 Gold future price down by 24 Rs to 27574 per 10 gram and it spotted at 27550 on Wednesday around 3:33 pm. get risk free free trial here..